Honda Motorcycle & Scooter India have launched the Honda CB300R in India for a price of Rs 2.41 lakh (ex-showroom, Pan India). It may have taken Honda a while, but they've finally got a new offering in the sub-500cc motorcycle line-up. For years, the company only offered the CBR250R in the premium quarter-litre sportbike segment, but now they've brought the spanking new CB300R 'Neo Cafe Racer' in the country. Not to mention, at Rs 2.41 lakh, Honda has priced it really well, despite the fact that it's assembled here as a CKD. However, the CB300R will only be sold through the 20 Honda Wing World dealers in India. The main highlight of the CB300R has to be its modern retro design, which draws inspiration from the new CB1000R. It's almost a scaled-down version of its litre class sibling, and we think it'll have a lot of takers for this fact alone. That said, it also comes with an all-digital instrument cluster an LED headlamp and taillamp. It's available in two colours - red and black. On the mechanical front, the CB300R is equally promising, for it's powered by a liquid-cooled 286cc single-cylinder engine that churns out 30bhp and 27.4Nm of torque. The engine is mated to a six-speed gearbox, which is operated via a hydraulic clutch. The bike also features 41mm USD front forks with five-stage preload and a rear mono-shock mounted on a brand new tubular and pressed steel frame. The CB300R also comes equipped with IMU based dual-channel ABS. 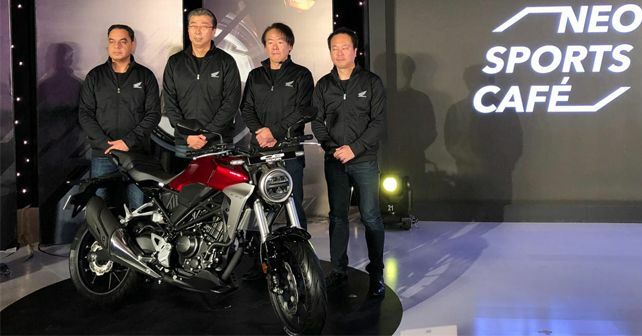 The CB300R will compete against usual suspects, the KTM 390 Adventure and BMW G 310 R. However, given its pricing, it'll also have to fight with the likes of Royal Enfield 650 twins and TVS Apache RR 310.